Shane Perrin began his journey in Tampa Bay Florida on March 2. Perrin entered the 300 mile small boat race called the Everglades Challenge. Perrin didn’t enter with a traditional boat. He entered the race with a stand up paddle board (SUP). Perrin’s paddle board was a custom 18 foot by 26 inch wide Pau Hana EC1. Custom features included a special fin and extra fiberglass for additional strength. Perrin still managed to get a hole in the bottom of the paddle board. Fortunately, he was able to make a crude repair that lasted throughout the race. Perrin said his days were long and his sleep-time was minimal. He did a 34 hour paddle during one stretch of the race. Most evenings Perrin would make sleep stops by the side of a canal or in a parking lot for 1 or 2 hours of sleep. During one of his sleep stops, his paddle board gear was stolen. He lost his locator beacon, food, cash, and other essentials to complete his journey. The theft of his gear made it evident that he would have to withdraw from the race, so he updated his friends on facebook about the theft. Friends and strangers immediately came through with replacement gear and money. Within 12 hours of the theft, Perrin was back on his paddle board. Perrin also had a few problems with hypothermia. He fell off his board twice during the early morning hours when the air temperature was in the low 40's. He had no other choice than to paddle ashore and remove wet clothing. One of his impromptu warming huts was a bar along the route. Perrin paddled across the Key Largo finish line in 6 days, 14 hours, and 13 minutes, to become the first SUP competitor to ever finish the race. Finishing the Everglades Challenge wasn’t enough for Perrin, so he tacked on another 100 miles by paddling to Key West. Perrin finished the 400 mile journey in just 9 days. Perrin is the recipient of a kidney transplant. 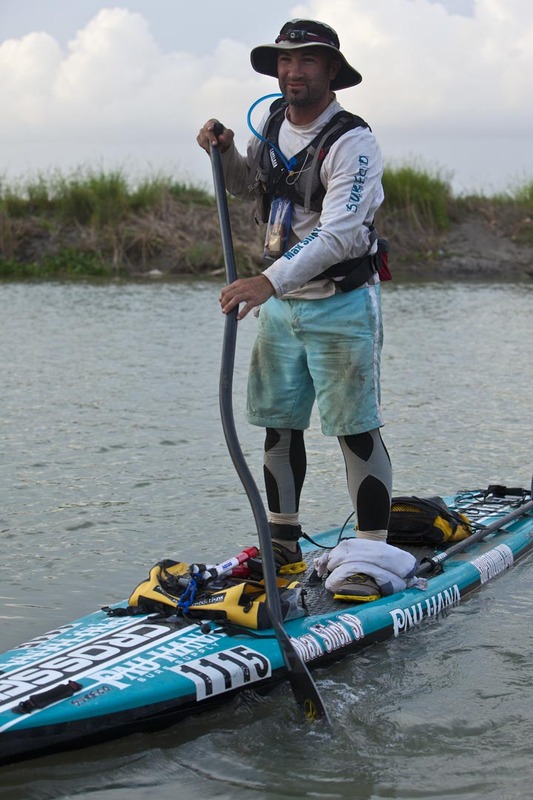 His endurance paddling mission is to raise awareness of organ and tissue donation. Audio interviews of Perrin’s experience can be heard on the website: Sup Radio Show.